2017 Spelling Bee will be held from Mary 30 to June 1; Winners of past 9 Bees, including last three joint winners, were Indian Americans. In order to avoid crowning joint champions, the Scripps National Spelling Bee is changing the rules for the finals this year. The last three Bees produced joint champions, which was unprecedented in the competition’s 89-year history. The 2017 Spelling Bee national finals will be held at the Gaylord National Resort and Convention Center in National Harbor, Maryland, from May 30 to June 1. Presented by Kindle, the Bee will be nationally televised by ESPN and sister channels for the 24th consecutive year. The Preliminaries will be held on May 31, and the Finals on June 1. This year’s contest will have 290 students, between ages of 5 and 15, representing all 50 U.S. states, the District of Columbia, and territories, as well as six foreign countries. 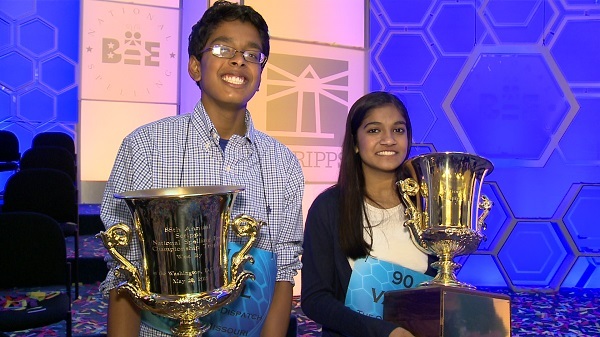 The last year’s Bee co-champions were Indian Americans Jairam Hathwar and Nihar Janga. It was the ninth successive time Indian American spellers won the prestigious championship. The E.W. Scripps Company, the organizers of the popular contest, announced on Tuesday that a Tiebreaker Test will be give to all spellers remaining in the competition at 6 p.m. on Thursday, June 1. It will be written test, consisting of 12 words and a dozen multiple choice vocabulary questions. If the competition doesn’t produce a single champion after 25 consecutive rounds involving three or fewer spellers, officials will reveal the Tiebreaker Test scores of the remaining spellers. The winner will be the speller with the highest score. If there is a tie for the highest Tiebreaker Test score, the spellers with the tying highest scores will be co-champions. Another change this year will be in the Preliminaries Test, where spellers will handwrite their spellings. The answers will be hand-graded. In previous years, the Bee used computerized forms. The official source for words this year will be Merriam-Webster Unabridged dictionary. Merriam-Webster’s Third New International Dictionary, the previous source, is out of print now. “The very first bee started with nine students, and now the Scripps National Spelling Bee program reaches more than 11 million,” Paige Kimble, executive director of the program, said in a press release. “During our history, students have expanded their spelling abilities and increased their vocabulary to push our program to be even more challenging.” Kimble was the Spelling Bee champion in 1981. 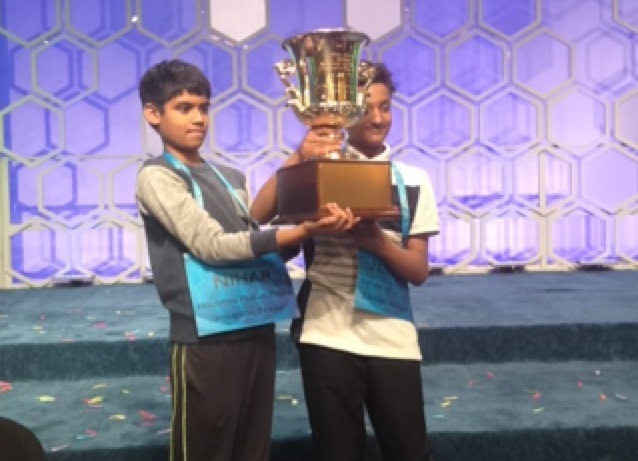 2016 Spelling Bee cochampions Nihar Janga (left) and Jairam Hathwar.